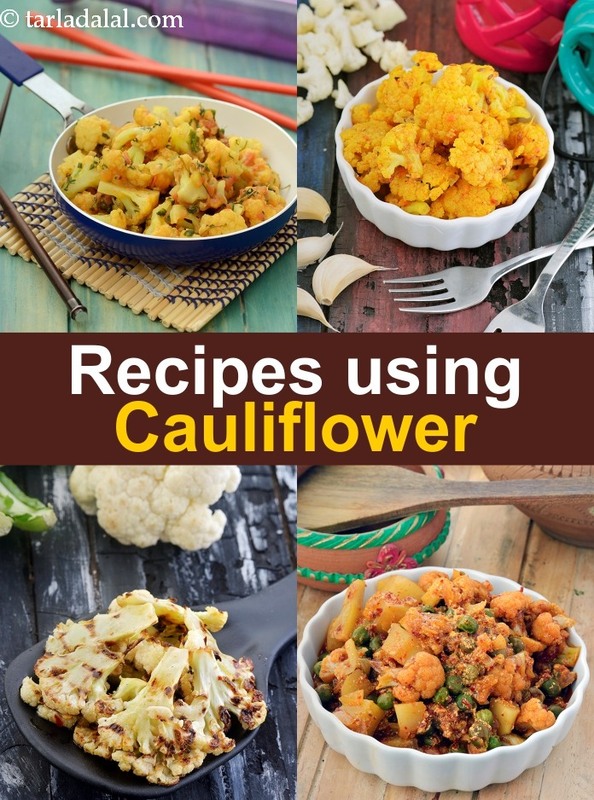 We have a large collection of 445 different types of Cauliflower recipes. Yes, it's clearly evident that Gobi and the different types of Gobi recipes are super popular all across our lovely country. Cauliflower, or as widely called in India, Gobi, is a used a lot in Indian recipes and many others around the world. It is a healthy vegetable with a unique taste and is a powerhouse of nutrients. This is the reason why cauliflower is gaining so much popularity now in the western cuisines, but was always used in Indian. Whether it's had on its own in a cauliflower subzi, or with other vegetables, its versatility will surprise you. Here are a few Gobi recipe ideas you can incorporate in your daily routine. Starting with the classic of the Indian gobi recipes, Aloo gobi recipe is something that is made every week. It can be a dry subzi or with gravy and spices served with rotis or naans. If you want to try something innovative, turn this subzi into either Aloo Gobi Paratha or Aloo Gobi Pulao! For another spin to it, fire up your tandoor and make Tandoori Aloo Gobi! Who knew a simple subzi can be transformed into so many dishes?! All cauliflower subzis can be eaten with parathas but what's better? To put the cauliflower inside the paratha itself ! There are a number of combinations to try starting with the basic Gobi Paratha with a stuffing of grated cauliflower and onions. Paneer makes a great stuffing for parathas but paneer and cauliflower is better. Cauliflower and paneer lifafa paratha is innovative and a great way to make people who dislike gobi, eat gobi. The same way, you can replace paneer with cheese and make a Cheesy cauliflower paratha that kids will love! With ginger, saffron, curd and other spices, Mughlai cauliflower, potatoes and green pea subzi will give you all the royal feels. As I said before, Gobi Recipes can be found in every part of India. In Punjab you can find Aloo Gobi Methi Tuk with a delicious taste of methi and chaat masala. In Bengal, there is a Panch Phodoner Chorchori flavored with Panch-phoran masala. Gujaratis have their famous Gobi Vatana Subzi, loved by all. Making gobi subzis is really simple too. It's just a matter of switching out different spices and vegetables and mixing them up. Gobi methi is made with methi leaves, garlic and garam masala while Shahi Gobhi is served with a gravy of tomatoes, onions, cardamom and cloves. On similar lines, you can add paneer to shahi gobhi and turn it into Cauliflower Paneer subzi. Undoubtedly the most famous starter of cauliflower would be Gobi 65. Originated in Chennai, gobi is first marinated and then fried and tossed in garlic and chilli to make a delectable snack. For a rainy day snack we have the Gobi pakora, perfect when had on a cold, gloomy day with a cutting chai. Cauliflower also tastes delicious when marinated in a tandoori marinade and then cooked to make Tandoori gobi. Puris are loved by all, but the real taste comes with the filling. Stuffed cauliflower puri is something different and a definite must try. For something healthy, Cauliflower oats tikki is the perfect choice. it has the goodness of both oats and cauliflower which is flavored by garam masala, amchoor powder and also ginger-garlic paste. Another innovative way to use gobi is to make Gobi Manchurian recipe, an Indo-Chinese fusion dish. To give certain volume and thickness to a soup, you can add cauliflower to it and blend it, for example in this Lettuce and Cauliflower soup or if you can you can just make a plain and simple Cauliflower soup which tastes creamy and earthy. There can even be chunky soups with cauliflowers! With fiber rich ingredients and crunchy veggies, Grean peas, carrot and cauliflower soup is a flavor bomb you wouldn’t want to miss. Due to the creaminess of cauliflower when pureed, you can transform it into various dips for parties and snacks and avoid the unhealthy, fattening dips by making Cauliflower Spinach dip. Being a great ingredient that can adapt different flavors, it is perfect for stir fries, whether it be a simple side dish Quick Cauliflower stir fry with garlic or a more Chinese one with Cauliflower in Schezuan sauce. We hope you enjoy our cauliflower recipes and gobi recipes collection given below. Tomatoes, onions and an aromatic spice paste overpower the blandness of cauliflower, making this cauliflower curry a lip-smacking delight. Throw in a handful of crumbled paneer to add more body to the subzi and make it more appealing too.